Please email us at: orders@wideopentees.com with all refund or exchange inquiries before returning your order. We'll then ask you to send back any unwashed items within 30 days (Yup! We said 30 whole days) and we'll be happy to issue a refund or provide an exchange. Please note that customers are responsible for delayed or lost items for all returns. It’s highly recommended that you use a reliable shipping method with a tracking number or delivery confirmation. Return shipping costs are non-refundable. • What is the return shipping address? • What type of shirt do you use? 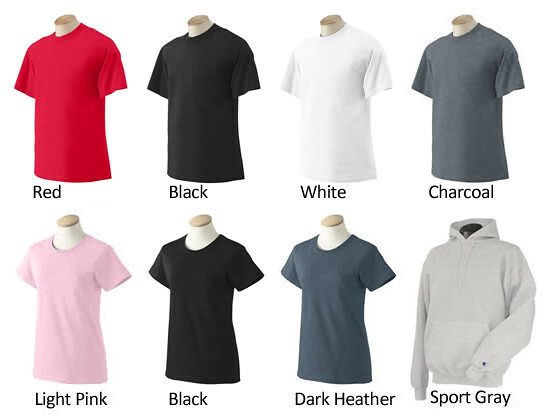 We use Gildan 100% pre-shrunk cotton shirts and Champion hooded pullovers. A couple of the highest quality apparel on the market! • Is there a guarantee? We stand behind all of our products and guarantee 100% satisfaction. If you're unsatisfied for any reason, don't worry, we'll fix the problem. Please send an email to: orders@wideopentees.com and we'll be happy to address any problems you may have. All orders are processed directly through PayPal. You do not have to have a PayPal account in order to pay. We do not store any credit card information at all. • Where is my tracking number? We'll attach a delivery confirmation number to the PayPal transaction once your shirt is shipped. Delivery confirmation numbers are only available for shipments within the US. Please allow up to 48 hours for tracking information to update. 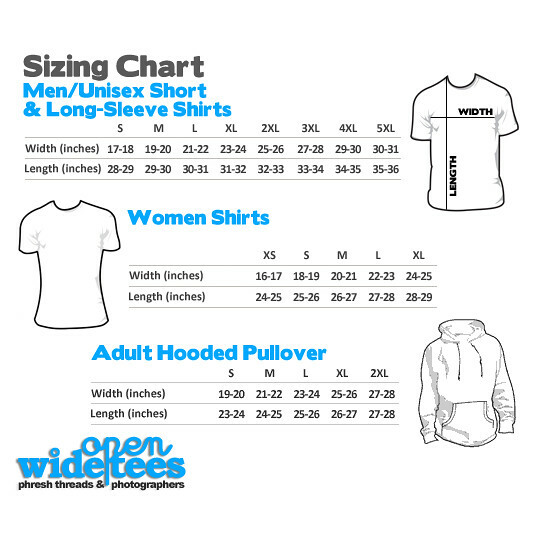 • Do you have a color and sizing chart? • Can you make a custom shirt for me? We sure can! We have a talented design team on hand ready to produce a shirt specifically for you. Please email orders@wideopentees.com with your custom order needs. • Are these shipped from the US, and how long does it usually take to arrive in my mailbox? All orders are shipped from our office in Austin, Texas. We ship via First Class mail and Priority mail. Most domestic customers receive their order within 7 business days. • How can I reach customer service? Email us! Our customer service staff works 24/7 and will answer your emails within 24 hours; usually sooner. • There's a mistake with my order. What do I do? Don't panic! In very very rare cases, mistakes occur. Send us an email and we'll be more than happy to fix the problem! • I can get a shirt cheaper on CafePress and Zazzle, why should I buy from you? We're a team of photographers that want to provide photographers with high quality photography shirts. We're not some random person trying to make a quick buck and run with it. We stand behind our high quality products and service. Also, we guarantee our designs never fade, crack, or dry out no matter how many wash/dry cycles the shirt goes through. Not many companies can guarantee that. Give us a try and you'll be pleasantly surprised! • I got a sticker or decal with my order, how does it work? It is indeed a decal. Every once and awhile we throw in special Wide Open Tee decal with your order. This decal can be stuck on anything hard, smooth, and clean. The best surfaces are usually glass, metal, or plastic. Step 1: Peel the decal and clear cover off of the blue backing. Step 2: Apply to a clean, smooth, hard surface. Step 3: Apply even pressure across the entire decal. Step 4: Remove the clear top layer from the decal. Step 5: Enjoy! Unlike stickers, the decal leaves no residue when you want to discard it. They are also weather resistant!